My work mate bought some pond plants in today! Yeah, I know it wants topping up but I needed to get the photo before the sun went down! If you think yours needs topping up you should see my neighbours lol, I wouldnt have realised if you had not of said. 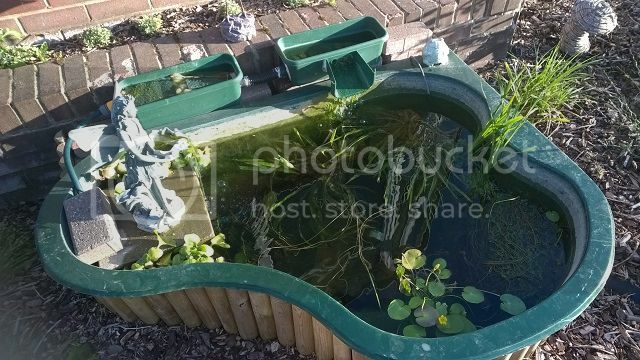 The wind blew the angel over last night and she emptied most of the pond onto the garden. 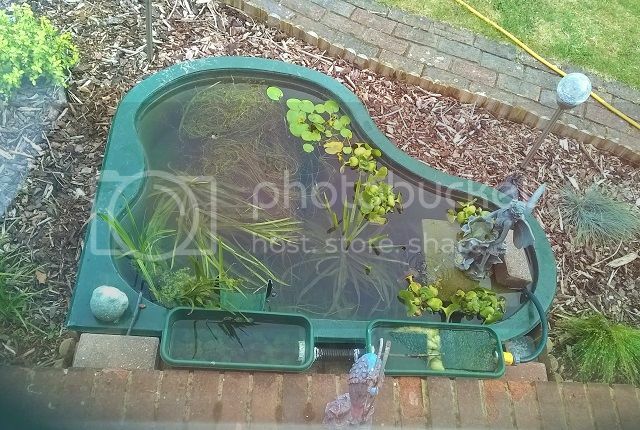 I've filled it up again, I hope the babies are ok. I am sure the babies will be fine, there are a load of plants in there to hide in amongst and she isnt huge. Yes, I'm sure the fry appreciate the plants. I was going to put the thing that looks like a green jellyfish around the base of the fairy (apparently it's not an angel, it's a fairy!) to help hide the bricks and pipes and stuff. I would say she is a fairy more than an angel too lol. Apparently, she is now to be known as Naida the water nymph. lmao, welcome to the forum Nadia.